Vivian Elizabeth Larmer of Overland Park, KS, originally from Wichita, KS, passed away suddenly on August 1st, 2018 having just celebrated her 92nd birthday on July 26th. Funeral services will be held at 2:00 on August 10th at Christ Church Anglican, 5500 West 91st Street, Overland Park. Vivian was the loving wife of the late Bob F. Larmer, and devoted mother to Susan Brown (Joseph) of Overland Park, and Patricia Larmer (Joe) of Reno, NV. “Grammy” to Justin Brown (Genevieve) of Kansas City and Adam Brown (Kat) of Jersey City, NY and Great Grammy to Adam and Kat’s new son, Walter Joseph. Vivian lived a wonderful life. 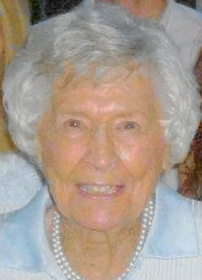 She and Bob were active members of Crestview Country Club in Wichita for many years. She was an avid golfer and was a member of the hole in one club! She made their home a fun gathering place for their many friends and those of their daughters who thought of her as a second mother. She had the gift of making all feel valued, welcomed and important. . But her greatest happiness was found in the devotion to her family and extended family. She loved her nieces and nephew and greats and enjoyed making their time spent with her a true adventure! Holidays were filled with fun and laughter as the family all descended on the Larmer home. She made everything look easy and relaxed. Vivian had many interests. She loved reading the Wall Street Journal and was a sharp stock picker. She loved traveling and was an avid reader. After raising their daughters she went into the estate sale business in Wichita and started her own company H.H.&L. She loved the hard work and the challenge. She moved to Overland Park, KS in 2006 after Bob F. passed away and was able to create a new life for herself. During her years in Overland Park, she relished the time she spent with her son-in-law’s large family and was blessed to have been a part of Joe and Susan’s 11 nieces and nephews lives. Summers spent at Walloon Lake, MI. with the clan were always a highlight as were times spent with Susan’s friends. Vivian lived a rich full life up until her last days. She believed the glass was full and life owed her nothing. She was strong, independent, elegant, and gentle. Quite a combination. Vivian is also survived by her dear Sister-in-law, Joyce Burrus , Nieces Julie Olberding (Ron), Kristen Burrus, Nephew Dave Burrus, and Great Niece Sydney Burrus and Great Nephew Taylor Bond. In lieu of flowers, memorials may be made to Christ Church Anglican.